Folding industrial gates are designed to make your facilities more secure and still allow frequent, easy access to those who need it. They fold easily back and out of the way when people or equipment need to pass, but provide a lockable barrier when closed. These gates are excellent for situations where compact, restricted access is a priority, but visibility and air flow are desired as well. 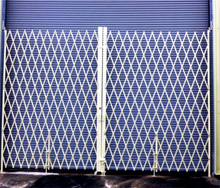 Secure your warehouse, your bay doors, your aisles, and other restricted areas with easy to install folding gates. Every gate retracts to a fraction of its extended width, and will pivot up to 270 degrees to clear the doorway. Arranged to accept padlocks. Constructed from heavy-duty steel U-type channel riveted back-to-back. All double gates are secured with drop pins and feature steel ball bearing swivel casters for easy opening and closing. The webs are riveted to vertical rails and rivets are secure behind, to prevent tampering. No welding required for installation. Gates supplied with mounting brackets and bearing washers. ALSO KNOWN AS: Folding Gate, Steel Accordion Gate, Retractable Gates, Door Gate, Retractable Gate, Industrial Warehouse Gates, Accordion Gate. How soon will I receive my gate? Your order usually ships within five days (arrival depends on where you are located), but often it can ship faster than that. Even custom orders usually take 7-10 days. I only received two “L” brackets for the top of the gate. Don't I also need brackets for the bottom? No. Your gate rests on bearing washers, and drop pins that fit into holes in the floor that you've drilled. What if I don't want to drill holes in my floor to mount my single or pair gate? You can special order a shorter truncated gate with special brackets designed to hold the gate off the floor. Contact us for details. Do I need to drill holes in the floor for my pair gate's self-securing drop pin? Yes. Self-securing drop pins, which must be inserted into floor-holes, are required for pair gates to join properly in the center, when closed. Can I install the “L” bracket up, instead of down? Yes. If you want easy access to the bracket bolts. However, this configuration provides less security. Should I lubricate the gate? Not usually. Normally your gate requires no maintenance. In harsh environments (severe winters, coastal conditions) lubricating the gate periodically with white grease is a good idea. When do I need an “H” bracket? You can install an “H” bracket above where two sides of a pair gate meet. Each half of the gate joins to the “H” bracket, providing greater rigidity and security. An “H” bracket installed in your opening will reduce clearance height of forklifts & other vehicles.